London, May 28 (PTI) Senior batsman Yuvraj Singh will be missing India's opening warm-up game against New Zealand today at the Oval, ahead of the Champions Trophy, as he is down with viral fever. Indisposed Yuvraj has missed the first two warm-up sessions. However the BCCI has confirmed that the senior pro is recuperating well as per the information of the medical team. "The BCCI Medical Team confirms that Indian all-rounder Yuvraj Singh who is presently down with viral fever is making steady progress. There are no major health concerns and he is recuperating well, to the satisfaction of the medical team," the release stated. "He is advised rest and will miss India's first warm-up match against New Zealand at The Oval on May 28, 2017. 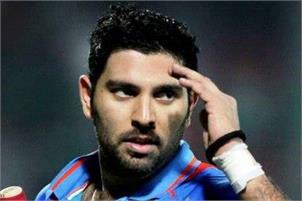 The medical team will continue to monitor Yuvraj Singh's progress and hope for a speedy recovery," it further stated.